I hope you are all enjoying a wonderful holiday season. Wishing you much love, health and happiness for the New Year! Prepare by thinking about how you feel about eating and the holidays. Make a conscious decision about what you want. Write it down. Make a list of specific events coming up where you might be tempted to overeat. Based on your list of events make a plan about how you will ying the yang so you can enjoy yourself, guilt free, without weight gain. The days/weeks leading up to the season or event eat healthy (fruits, vegetables, lean meats, avoid starchy bloating food like bread, muffins, rice, potatoes, no junk food or drinks, limit your sugar intake), drink lots of water and workout daily. On the day of the event eat light and healthy and drinks lots of water prior to arriving. Have two glasses of water before you go to the event and a healthy snack if you’re feeling hungry, like an apple or banana. At the event decide: Is it crap? Is it worth it? Is it truly delectable? Since you have “pre-paid” for your indulgences, enjoy them! After the event start your day with a big glass of water. Skip breakfast if you’re still full, continue with healthy eating, portion control, lots of water and extra workouts! Have fun, enjoy and feel good! 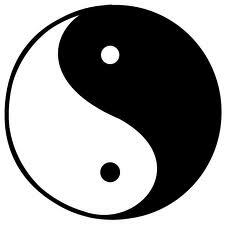 Where there is a ying there should be a yang to keep things in balance. In other words what goes in needs to come out, in one form or another. if the event is in the evening, drink at least 8 cups of water through-out the day (and everyday!) – start your day with a big glass of water before you do anything else, it will clear you out and give you energy, then have a glass of water every hour for the next 7 hours. eat a light breakfast and lunch but not to the point that you are starving when you arrive at the event and then pig out. drink two glasses of water right before the event and if you are hungry have a light healthy snack before you go (like an apple or banana). 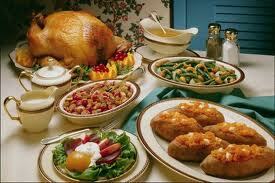 Avoid starchy food that will make you feel bloated and full: rice, potatoes, bread, pasta, crackers, etc. Be picky! Be choosy! Don’t eat crap! Savour the food you love, take your time! Consider each thing you eat and ask yourself: Is it worth it? Is it crap? Is the extra cellulite worth it? How will I feel after I eat this? Crap makes you feel like crap! Eat one and enjoy it. Having more does not make it more enjoyable especially if you feel sick from over-eating afterwards. Ask yourself why… am I bored? uncomfortable? eating unconsciously? Skip breakfast if you ate a lot and are still feeling full the next morning – the key here is to take a moment to notice how you feel. It’s just as easy to lose a few pounds as it is to gain a few pounds. Do not starve yourself to do this! That is the absolute worst tactic. Just eat healthy, no crap, small portions, lots of water, cut the sugar. Make sure you have at least one bowel movement the next day (and everyday!). If it’s not coming, check your water intake and drink more. Also, I find a big salad always helps. Still not coming, drink 1/2 of a glass of prune juice and wait half an hour. If still nothing, another 1/2 of a glass and wait, repeat until success. Go for a long walk, a run, to the gym, to a class… workout! Then I think about the food that will be available at these events and whether I’ll want to enjoy it. Stop and consider: Is It Worth It? Is stuffing my face for the month of December worth the extra pounds at the end? How will I feel January 1st with an extra X pounds on my frame? Was it really that enjoyable? Were those delectable treats delectable at all? At the end of Christmas dinner, how do I want to feel? Do I want to have to undo my button and zipper? Do I want to feel bloated and sick? Do I really need to eat three plates full of Xmas dinner? Is it actually more enjoyable when I eat more? Is it actually tasty & delicious or am I eating it out of: boredom? something to do? unconsciousness? feeling uncomfortable at a party? obligation? What are natural ingredients? If I can’t pronounce it or don’t know what it means then it’s crap. Pretty simple, huh!? How do I know it’s crap if it’s on a platter and there is no package to read? I look it over, does it look like it’s made from natural ingredients or from a package? If it’s homemade chances, are it’s not crap. If it looks like it’s from a package, chances are it’s crap. The more I check the ingredients, in general, the more I have learned to tell the difference and taste the difference. You will be amazed at the difference once you get into it. I consider how I will feel after I eat it. Crap makes me feel like crap. Just eat food you love and enjoy. This is a big one. Once you’ve decided on what you want, embrace it. What you think and say to yourself after that is everything. If you start to lament that you’re on a “diet”, that you can’t eat this or that, that you wish you could but you don’t want to gain weight, then you’re hooped, it’ll be difficult to stick to your plan. Focus on what you’re having instead of what you’re not having. With the right attitude you won’t miss a thing and enjoy what you have. I used to work in an office where early December the gift baskets would start to arrive; chocolates, cookies, candies, cakes and more. I would start to indulge. Then came the office parties, the family gatherings and to top it off New Years! 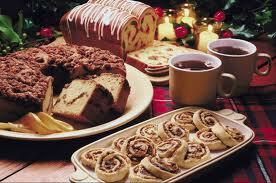 So every holiday season I would gain five to ten pounds. Afterwards, I would feel angry and disappointed with myself for my lack of self-control. It would take me months, if not the whole year, to get the extra pounds off. There were times it never came off, so my size grew as the years passed, adding to my frustration. Until I finally said, “Enough! This is not working for me, it is making me unhappy and I feel like crap”. So I devised a plan…. When I know there is a special occasion or season coming up that may involve overeating on my part I begin to prepare my mind and my body. So I go into it feeling like I have lost a few pounds, my clothes feel looser. ( I am not a big fan of the weigh scale, so I don’t usually weigh myself. However, it can be helpful to gauge where you’re at. Use it as a tool not a weapon.). Get in touch with your body and how you feel. Take some time to think about what you want and set your own goals. The key is to making a conscious decision about what you want. A goal without a plan is merely a wish.